The vision of LifeVac came from a story that Arthur Lih, founder and CEO of LifeVac, heard a woman in a hospital weeping following the death of her young son, after choking on a simple grape. The reason for his death was that the grape had become lodged in his windpipe and could not be dislodged. Once he heard the story he set out to invent an apparatus that could clear the airway of a child in the event of choking and save lives. Arthur, Dr. Brody, and a few close friends set out to bring LifeVac to the public by establishing a research and development facility located in Springfield Gardens, NY where they are producing the anti-choking device in order to bring the safest, simplest method to save a choking victim. Our goal is to save as many lives as possible throughout the world. LifeVac Canada Inc. was established in 2016 to distribute this live saving technology in Canada. LifeVac Canada Inc. is the sole distributor for the LifeVac device in Canada. The LifeVac is a unique device developed to address one specific problem, choking that is unrelieved by normal first aid methods. Unfortunately, a range of individuals are at risk from choking, including children, the elderly and those with a disability affecting their ability to swallow. It is the only device on the market that addresses this problem. LifeVac came to close the “gap” that always existed after and/or in case of failure of Heimlich maneuver. Foreign body remained in the airway of the choking victim, completely blocking it, resulting to lack of oxygen which lead to almost certain Brain Damages, which in order to be avoided required use of an Automated External Defibrillator (AED) and cardiopulmonary resuscitation (CPR). LifeVac is a unique “Medical Miracle”. 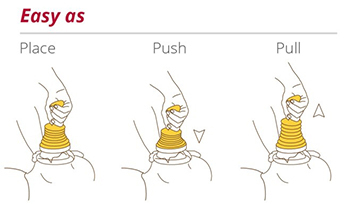 It’s a single use lifesaving apparatus (Single Use Medical Device Class I) produced in the USA that has revolutionized, for the first time ever, the way Choking is treated. 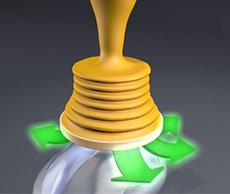 LifeVac effectiveness, in removing an obstruction from a blocked airway, has been documented by various studies, with the latest one contacted on March 2016 in New York, and published in the American Journal of Emergency Medicine. The independent study proved that LifeVac removed successfully, the dislodged obstruction of the blocked airway, 49 out of 50 trials on the first pull !!! LifeVac is designed with a patented valve to prevent any air from exiting through the mask. This patented designed valve prevents air from pushing food or objects downward. This creates an one-way suction to remove the lodged food or object in the event of choking. 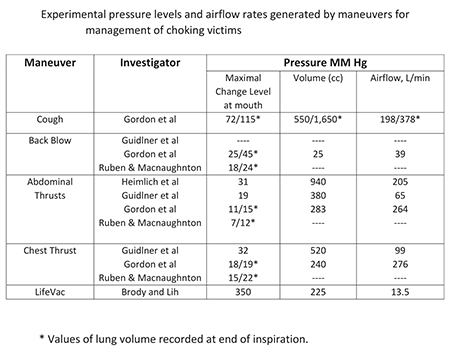 The negative pressure generated by the force of the suction is 3 times greater than the highest recorded choke pressure!! LifeVac generates over 300 mmhg of suction. The duration of suction is minimal so LifeVac is safe and effective. LifeVac is a single use lifesaving apparatus (Single Use Medical Device Class I) produced in the USA that has revolutionized, for the first time ever, the way Choking is treated. Everybody can use it because it doesn’t need any special training or medical knowledge as it can be applied with three (3) easy moves and without any extra effort.